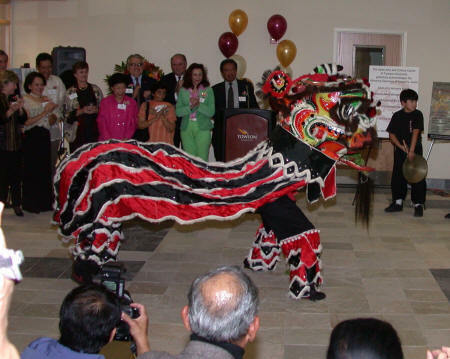 On Friday, November 4, 2005, Jing Ying Institute had the privilege of performing a Lion Dance as part of the grand opening ceremony for the Asian Arts Gallery in Towson, Maryland. 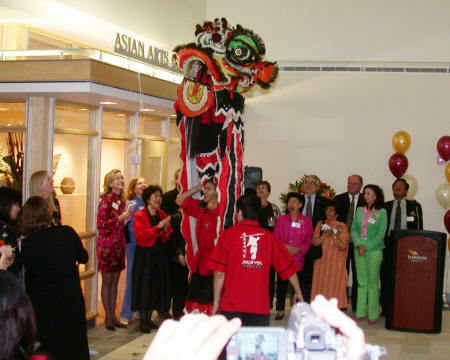 The gallery is part of the Asian Arts & Culture Center at Towson University. 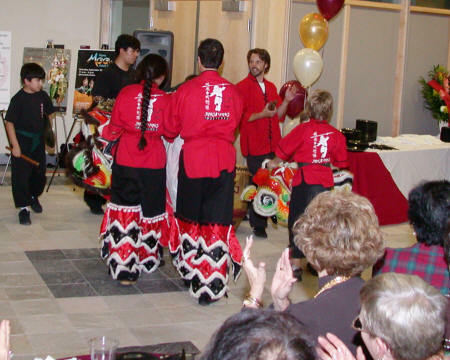 The Lion Dance ceremony was part of a private, catered event for members and guests only. 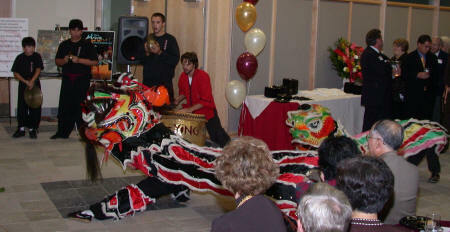 There were over 300 people in attendance and the Jing Ying team got nothing but compliments on the performance. 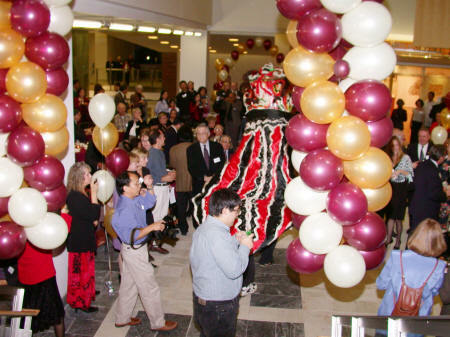 Several members of the board told us they thought the noise, energy and excitement of the Lion Dance was just what was needed to ensure this was a night to remember! We performed a traditional bow, interacted with the audience, did a shoulder stand to retrieve the "green vegetable," and the Lion "spit" the vegetable on board members to help ensure good luck. 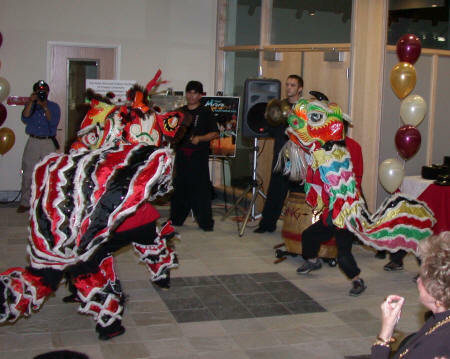 Kudos to our Lion Dance team for a great performance! 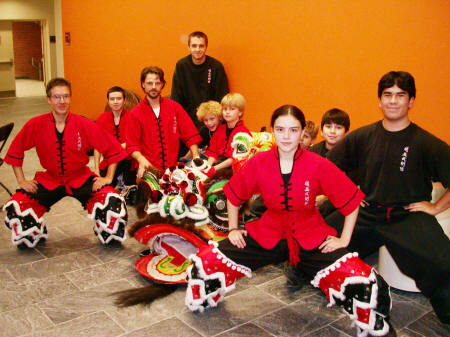 The Lion Dance team before getting started. 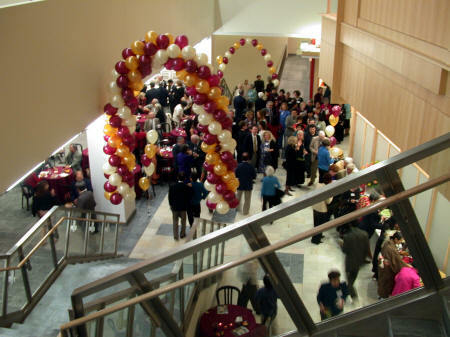 View from the upper level of the main entrance. We started with the lions coming down the stairs. Just after coming down the stairs and entering the reception area. string that held the vegetable hanging under the "Asian" part of the gallery sign. "Chewing" the green vegetable as board members observe. The little lion joins the big lion for a "big walk" and 7-star. Drop stance at end of 7-star and before final bows. Sweaty and hot from the performance, but happy it went well!